Spending time getting ready with a long shower, a pampered post shower routine, and doing my full hair and makeup is always fun but not always realistic. Most days I keep my beauty routine very simple with a quick shower, bare face, and simple hair. Since we've welcomed our little girl into the world, I'm even more inclined to have a quick shower routine (the longer I'm in the shower and getting ready means less time snuggling her sweet little face!). I realized more and more over the years how important it is to invest in quality products. I can totally tell the difference when I am using products that are not high quality, I break out, my hair is limp, or I feel sticky all day. I'm always trying new products and have currently narrowed my everyday post shower routine down to just three products, a face serum, a face cream, and a blow dry serum. 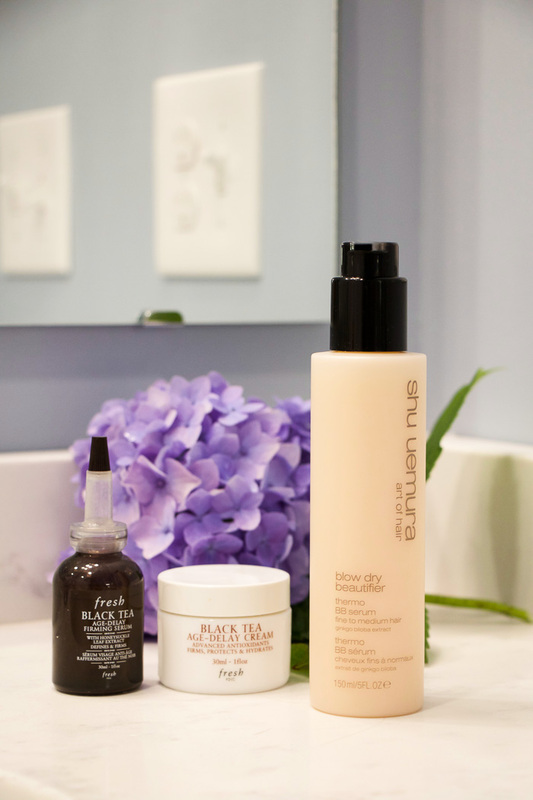 I've talked about the serum and cream before (here) but this blow dry serum is a new find. I actually first experienced this product that last time I had my hair cut, my stylist used this product on my hair before she dried it. I specifically remember taking note of the product she used since my blow out seemed bouncier, softer, and silkier than normal. A few days later I actually received this product in the mail and as so excited to see if I could recreate the outcome at home. 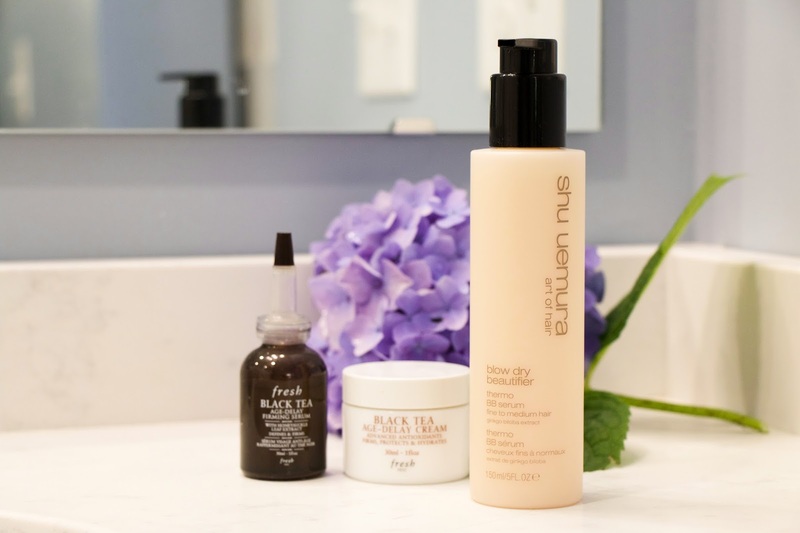 While my blow out will never fully mimic one done by a stylist, I did notice that my hair was still bouncier, silkier, and softer after using this product. Post shower, my routine now takes just five minutes, I apply my the Fresh Black Tea serum to my face first. While that is drying, I'll put some of the Blow Dry Beautifier into my hair and let that sit before combing it out. While that sits, I then put my Fresh Black Tea Cream on my face and finally brush out my hair. I don't wash my hair every day, usually two times a week, so lastly I'll blow dry my hair, which makes my hair last even longer between washes. 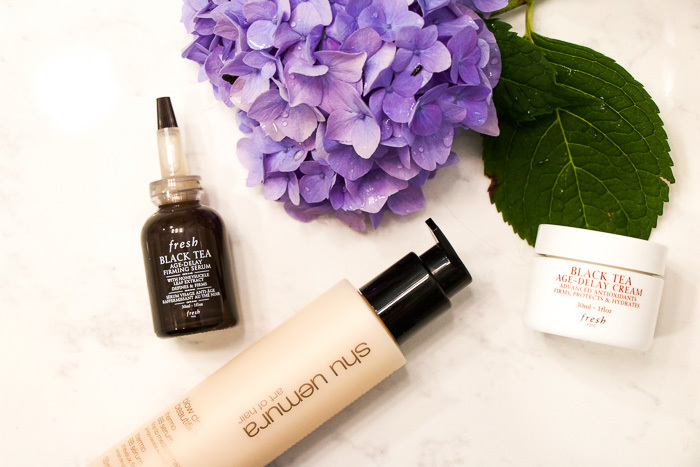 I'm always excited to try new beauty products, so if you have any must-have's let me know in the comments!